IDC released its latest report on the global shipment of "connected devices" and found that sales of such products, which includes PCs, smartphones and tablets, rose 27.1% to a record 303.6 million units shipped with a dollar value of $140.4 billion in the third quarter. For the current quarter, IDC sees the number of "connected devices" shipping globally at 362 million units for a 55.8% gain over last year's fourth quarter. Sales should rise 39.5% to $169.2 billion. Samsung had a tremendous third quarter with 66.1 million "connected devices" shipped globally, up 97.5% from last year. The Korean based manufacturer increased its leading market share to 21.8% from 14%. Apple trailed Samsung in all of the volume numbers, finishing second with shipments in Q3 of 45.8 million, up 38% from the 33.1 million shipped in 2011's third quarter. But even though the Cupertino based firm had a 15.1% share of the global "connected device" market, it was number one when it came to the top line. Thanks to an average selling price of $744 across its product line, Apple took in $34.1 billion in revenue during the third quarter to lead the category. Samsung's average selling price was $434. The trend toward smartphones and tablets and away from PCs can be seen in the performance of Hewlett Packard, which was the only company in the top 5 to have negative growth as its market share dropped from 7.4% in the third quarter of 2011 to 4.6% in the same quarter of 2012. HP is the only company in the top 5 with no mobile connected products. 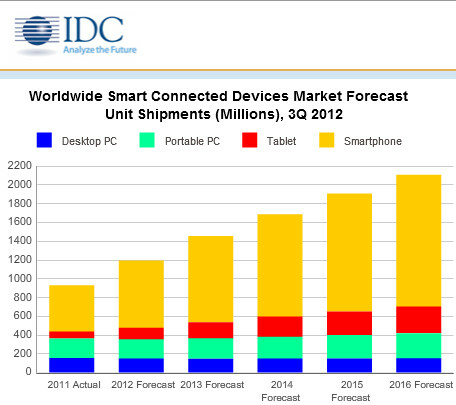 By 2016, IDC sees growth in global smartphone and tablet shipments to come in at 95.9% and 131.2% respectively. This article proves that more devices does not equal more value and revenue. It also proves you get more bang for your buck from Sammy, for the month of November I was using a 64gb iPhone 4s, I couldn't get my RAZR reactivated fast enough! honestly dude you need to get a life. please appreciate when credit is due. The article is no where trying to impose more value or revenue. It is just showing the tremendous growth of smartphones over the previous year. 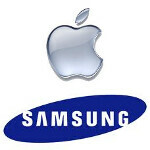 Don't start apple/samsung wars for no reason !!! btw do you really think such a tremendous growth wouldn't yield increased profits ? obviously.. Duh.. Apple will get more revenue and profit because they are selling overpriced aluminum-glass brick with glorified app launcher..
How would that make it obvious? That actually made no sense, that would b the reason it wouldn't make more profit. It's obvious that " that more devices does not equal more value and revenue." as value and revenue are not dictated solely by number of goods sold.. That's what I meant..
Go google Samsung/Apple and read what else more they sell. Except smartphones/tablets. Also the growth on Samsung sales, says all its more value then Iphones and learn to read between the lines next time. Of course not. More devices equals more people wanting you devices. I like how suddenly they're counting all "smart connected devices," which would likely include tablets for both. Considering that Apple is outselling everyone else handily in tablet shipments and they're still losing in total volume to Samsung by 20 million units, Samsung must be kicking the s**t out of them in smartphone sales. Um. Okay. I'll still take a Motorola phone please. Consumer love. I'm just kidding tho, competiton is always good :) it just that not all consumer appreciate it... In my country, a lot of people buy Sammy device without even know how to spell 'android'... Especially the elder, they just believe that Sammy is better than iPhone thats all, also they claim sgs3 make the sharpest and clearest screen in the world with the good looking design... Believe me or not, they are overhype... And I refuse to look my country's mobile review because it only post Apple and Samsung news and reviews only... That's why I join phonearena :) You think US consumer is dumb, but my country is even dumber... A lot of OEM has gave up my country except Apple and Samsung... A very dull mobile territory isn't it? And much worse, my country mobile review states that the iPhone 5 will coming this December and this will be the 1st 4g lte phone in the world... As much as I love Apple, I just feel disappointed that my fellow ifans are fapping just because of these so called 'revolutionary' features... And what did Sammy fans reply? They claim 4g lte is gimmick and useless and carrier has no lte network... Sad isn't it :( When I see some says PA is biased, I can't describe my country's mobile site, cause they're beyond biased, more like I can describe as PATHETIC!!! Sometimes we have to remember that not all people are into their phones or care to know what each brand can do, so they ask whats the best and popular and go with it. Thats like me going out and buying a lawn mower, I dont really care about the close brand comparing just give me a lawn mower thats popular and works; thats how some people view smart phones. May i know which country is it? You tell me.. even the "aunties" and "uncles" use iPhones.. and the MRT cart full of iPhones/Samsungs.. because they care more about the most popular brand.. Here in Indo, most people still use blackberry and think that android phones are from china.. Heck, they even think HTC is some sort of cheapo product from China.. smh.. 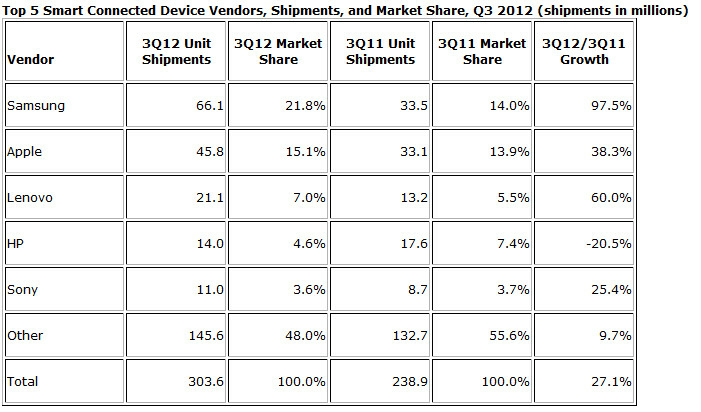 It's not a big deal when your 2011 phones are still ahead of the competition's 2012 offerings. And they are.